Two groups of YES Centre students undertook tours of the Augusta Power Stations site in early March, touring the demolition site and ash storage revegetation zone. Flinders Power representatives began the tour with a briefing, which gave students an insight into the history and operations of the power station before it ceased generating on May 9, 2016. The rehabilitation project is almost 80% complete, with completion expected in the second half of 2018. Flinders Power aims to leave the site in a condition suitable for future industrial use, with the possible sale of the land to a suitable buyer. 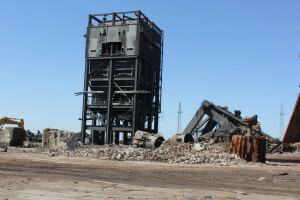 Demolition work is nearing completion and by conclusion approximately 50,000 tonnes of scrap metal will have been salvaged from the Augusta Power Stations site. Five trucks and semi-trailers have been continually moving scrap metal daily from the site and transporting it to the wharf at Port Pirie to be loaded on ships. Much of the scrap metal has been sold to Vietnam and a shipment of steel was due to leave Port Pirie on March 14. Students were surprised by the amount of steel still at the site, the enormity of the structures and the size of the machinery being used for demolition and salvage. Year 9 student Andrew Scott said the tour was “very interesting”. 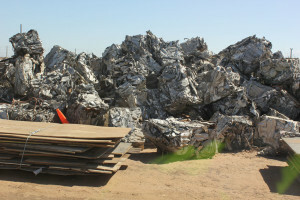 “I was very surprised by the amount of scrap metal that was there and by how long it took them to build and how little time it took to destroy it,” Andrew said. A long-term solution for the rehabilitation of the ash storage area involves covering it with topsoil and seeding native plants and grasses. So far, 220 hectares of the 273-hectare ash storage area has been covered with soil and 180 of these have been seeded, with germination in some areas. In coming months there are several more demolition activities planned, including the charge felling of the Northern Central Coal Bunker in April. The bunker will be processed for scrap metal. The Playford B Baghouse and Boilers will also be removed in April, using giant excavators, and in May the Playford B Turbine Hall will be mechanically demolished. 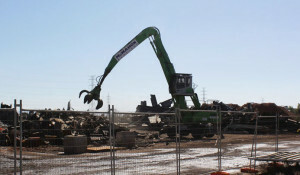 A huge, purpose-built mechanical arm has been built to assist with demolition. The final felling event will be the 200m Northern stack, expected in mid-2018. An exact date has not been finalised as approvals are still pending. Demolition work at the Northern Power Stations site.